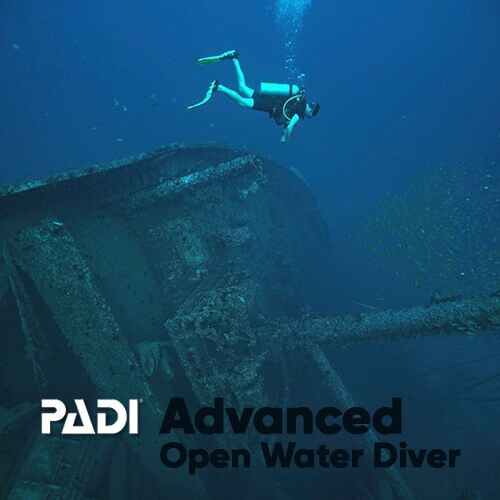 The PADI Advanced Open Water Diver Course is the way to go if you want to improve your scuba diving skills and gain more knowledge about diving, which results in more confidence and a lot more fun underwater! The AOWD Course doesn’t involve any training in confined water (swimming pool), only Knowledge Development and Open Water dives! The course consists of 5 different “Adventure Dives” of your choice, accompanied by their theory counterparts. At the end of the course, you will be certified to dive independently (with a buddy) up to a maximum depth of 30 meters. Because of this, you will not have to spend any time on land before your MV Giamani cruise, as you can do the whole course on the boat! Upon completion of the course you will be issued a PADI Advanced Open Water Diver certification which is recognized worldwide. This portion of the course is about improving your general diving knowledge as well as giving you more information about some specific aspects of diving and techniques that apply to particular situations. You will do 5 “Adventure Dives” and study their related chapters on the book, reviewing your knowledge with the instructor before each dive. The practical side of the AOWD course consists of 5 Adventure Dives, each dive is an intro to one of the many diving specialties we can enjoy as scuba divers. This includes 2 mandatory dives, the Deep Dive and the Underwater Navigation Dive. You can then choose 3 additional dives from a long list of available adventures (like the popular Night Diving, Wreck Exploration etc). With MV Giamani you can choose between two different ways to do your PADI Advanced Open Water Diver Course. With the PADI eLearning course option you will be able cover all the theory online in advance, then once here your MV Giamani instructor will quickly review your knowledge and clarify any of your doubts before you go in the water for some amazing diving. With the Full Course option you will have to cover all the Knowledge Development portion of the course once here in Phuket, which means spending more time sitting with our instructor. In either case, you will not have to spend any time in a swimming pool or a classroom, you will be able to cover the whole course while on your MV Giamani cruise as onboard there will be plenty of time to cover all aspects of the course without rush. 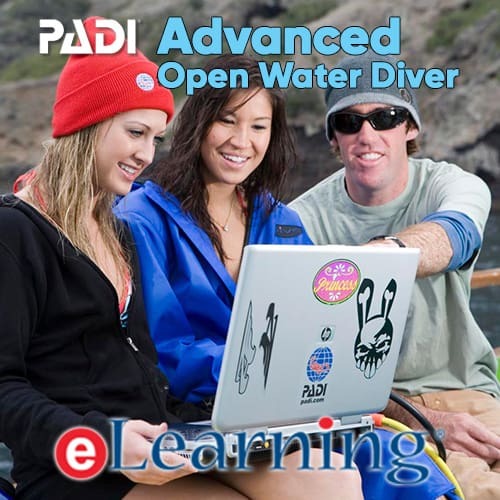 With the PADI eLearning Course Option, you will have the opportunity to have access to all the learning materials and complete the whole Knowledge Review portion of the course online in advance! This way you will save precious time while enjoying your cruise on MV Giamani, as you will spend less time being lectured by the instructor and more time relaxing. PRICE: 5,800 THB for 1 person → BOOK NOW! TOTAL DURATION: 4 days Available from 15 October to 15 May only! PRICE: 11,500 THB for 1 person → BOOK NOW! The minimum age required to do an Advanced Open Water Diver course is 12. Divers between 12 and 14 yrs of age can earn the Junior AOWD certification, and must always dive under the supervision of an instructor or a parent/guardian. From 12 to 14 yrs old the maximum depth allowed is 21 meters, while from 15+ yrs it’s 30 meters. With the PADI Open Water Diver FULL COURSE Option you will cover all the training portions of the course on board MV Giamani. There will be plenty of time on the boat to go through all the Knowledge Development portions with the instructor, before each of the related Adventure Dives in the ocean. PRICE: 9,800 THB for 1 person → BOOK NOW! PRICE: 15,500 THB for 1 person → BOOK NOW! Below you will find all the prices for the PADI Advanced Open Water Diver course options we offer. The course price per person varies depending on how many people you are. 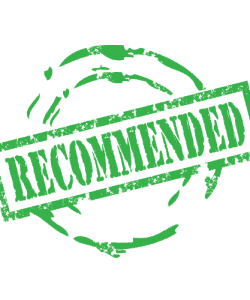 All the courses we offer are with PRIVATE instructor, so you will not have to share the instructor with a stranger or a big group. However, if you are a family or a group who wishes to do the course together, you will share the cost of the instructor and the price per person will decrease as described below.